“The only thing that changed in 5 years is the radiation level”, says Kazuhiko Yamauchi, the hero of “Campaign 2”, after reuniting with director Kazuhiro Soda. Five years earlier, Soda shot a documentary about Yamauchi’s first campaign for Kawasaki City Council, that the rookie politician won surprisingly by blindly following the rules of his party, the LDP. “Campaign” (2007) was a surprise hit for Soda and established his observational film style. The sequel shows Japan in a national crisis. Only 23 days have passed since the Fukushima catastrophe when Soda meets up with his protagonist again. The radiation level in Kawasaki has doubled, people are anxious and the political landscape is about to burst after the upcoming elections. Yamauchi is fighting between the fronts. This time, he competes as an independent candidate, because he does not want to continue the energy politic of his former party. From all the candidates, Yamauchi has the only anti-nuclear stance. He wants to fight for the future of his son, who does not know yet how society is about to change. But the change can be felt throughout the movie. The political culture is determined by new laws and the unrest and anger of the voters, who lost trust in their leaders. The main protagonist has also totally changed his attitude. Retrieving to a minimal level of campaigning, Yamauchi renounces public appearances and stands out through absence. Now that he is not part of the political circus anymore, Yamauchi appeals much more relaxed and the childish easiness of his son seems to pass onto him. The stressful and ridiculous street campaigning dominates his life no more. When it comes to filmmaking, Kazuhiro Soda had to overcome some new obstacles in this movie. His observational style, characterized by objective distance and a silent reporting of happenings, is somewhat disturbed by certain factors. First, Soda himself cannot hide behind the camera anymore. The success of “Campaign” (2007) made him a well-known character in the Kawasaki area. When he is shooting, people recognize and approach him. In some scenes, politicians talk with Soda and reveal themselves as fans of his work. The loss of anonymity is best shown in a shot with children at a playground. Soda wants to capture the children run around and play, but the kids come up to him and ask him what he is doing and start posing for the camera. The observational style loses its naturalness as the observer becomes the observed. Nevertheless, most parts of the film consist of old techniques. No edits, calmness and long takes, reflecting on the exhausting grab for votes. Most outstanding is the last sequence. 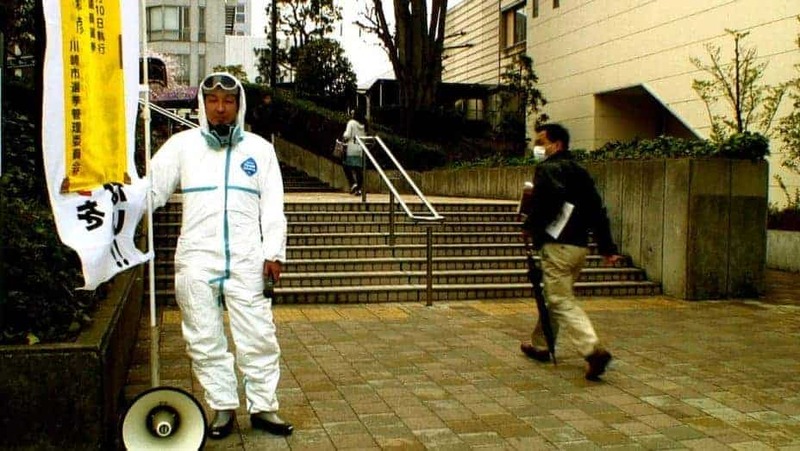 Yamauchi, dressed in a protective suit, makes one of his few public appearances, warning people of the dangers of nuclear power. The powerful shot shows him fighting a losing battle. As the camera turns further away from him, his voice perishes under the street noise and he gets surrounded by darkness. Alienated and forsaken, Yamauchi is left alone with his unheard far-off cry. “Campaign” and “Campaign 2” unfold their power in combination. One has to see both documentaries to gain the full picture of the microcosmos of Japanese politics. The sequel is even more impressive because it shows Yamauchi’s one-eighty character development. Unfortunately, he cannot win the council seats this time and Soda finishes his series with a depressing political outlook: Even in the consideration of a nuclear disaster, Japan will not change.